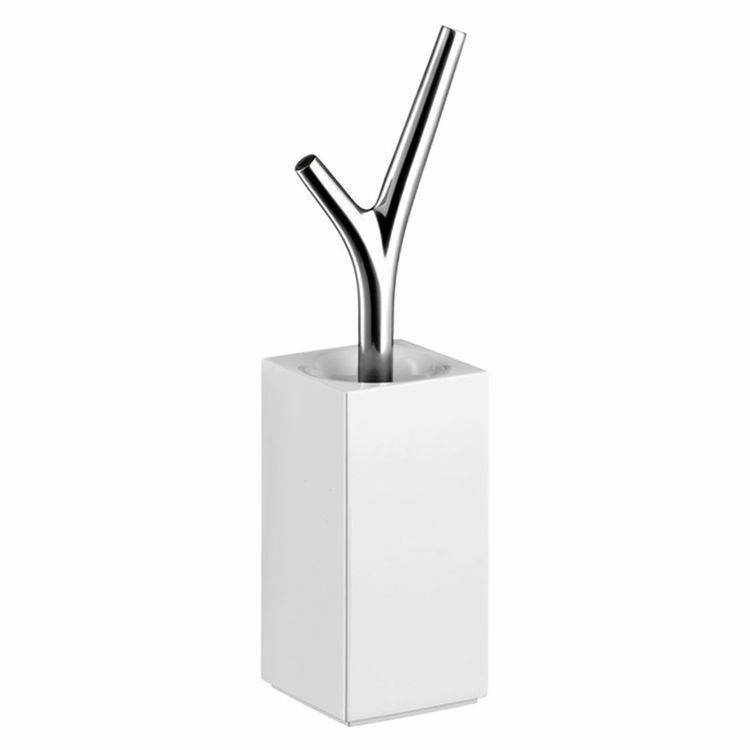 The Axor Massaud 42235000 Chrome Toilet Brush With Holder has the ultimate design if you are looking for a collection that immerses you in nature. The white finish makes it look classy and elegant in any bathroom setting. It blends well with other bathroom features. This Axor Massaud Toilet Brush with Holder is 18 1/2 tall and saves a lot of space in your bathroom floor, as it will only occupy 4 3/8 of the floor area. The toilet brush comes in white and is easy to clean, use, and keep germ-free. Its sophisticated and nature-inspired handle is ingeniously designed to make it look like a little silver twig sprouting out of a small white box in your bathroom. It includes a classy-looking cup to readily accommodate the toilet brush. It is made of long-lasting materials that do not compromise beauty. Mounting accessories are provided for a sturdy and permanent installation. The Axor Massaud Toilet Brush with Holder assures a lifetime of use and will timelessly provide that sleek, classic, geometric elegance. More details are available in the specification sheets. Axor Massaud is a bathroom collection that shows off its serene elegance that suits the nature-lovers eyes. Axor has been behind the beautifully designed quality showers, faucets, and other bathroom fixtures since 1901. Shipping Dimensions 19.1" x 8.1" x 8.0"